Can these five blue-chip stocks keep on winning? Many investors are wondering, is this correction one to buy or a nail in the coffin? Amid these troubling times, investors have been leaning on a few stocks to carry them through the turmoil. Will these blue-chip stocks continue to hold up though? After all, just look at Johnson & Johnson (NYSE:JNJ). This name had been a stud through most of the correction. With a decent but very dependable yield, reasonable valuation and strong balance sheet, J&J was an ideal safe haven. But then some negative news crushed the stock, sending it down more than 10% in just a few days. It goes to show just how tough this market can be. Let’s look at a few blue-chip stocks that have been leading the way but could crack like JNJ. Like many would expect, shares of McDonald’s (NYSE:MCD) have been strong through the recent turbulence. When volatility increases, it creates demand for high-quality, blue-chip stocks like McDonald’s. So to see its outperformance is not all that surprising. But can it keep it up? As the S&P 500 and Russell 2000 continue to bumble along support, the indices are threatening to break lower. So now investors are trying to weigh whether they will indeed break down or find their footing near these lows. I’m not one to blindly bet against the few stocks that are showing some relative strength. But if we lose stocks like McDonald’s, then investors’ question will likely be answer. In short, the answer won’t be good. Shares are still holding up over the $180 mark. Should they continue to do so, a run back to $190 is in the cards. If it fails, look for a drop down to the 50-day moving average. If that level doesn’t support MCD stock, a notable drop could be in store. Like McDonald’s, Procter & Gamble (NYSE:PG) has been another strong performer. Keep in mind, we could see a rotation out of these blue-chip stocks and back into beaten-down growth companies. However, it’s a breakdown in the former and the lack of a recovery in the latter that will really deal a blow to the markets. We now see PG stock sitting on uptrend support (blue line). 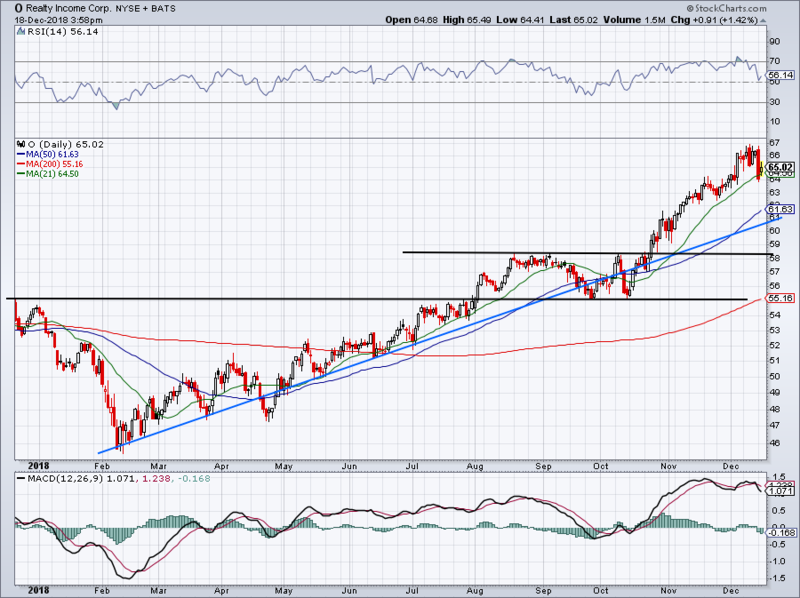 Below that mark, there’s another short-term uptrend support line as well as the 50-day moving average. Suffice to say, there are several levels for PG stock to firm up should it come under further pressure. However, if it loses these three levels, then PG stock price could be in trouble. A return to $85 could then be in the cards, while a gap-fill below $82 would also be possible. At that point in time, we’d have to see where the 200-day moving average is trading to see whether it would be support. 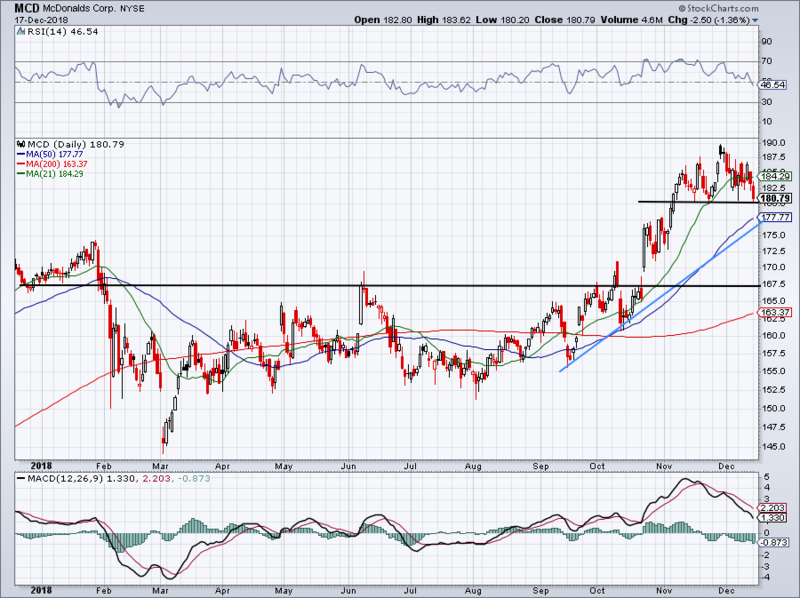 Nvidia (NASDAQ:NVDA) and Advanced Micro Devices (NASDAQ:AMD) have been under plenty of pressure over the last few months. 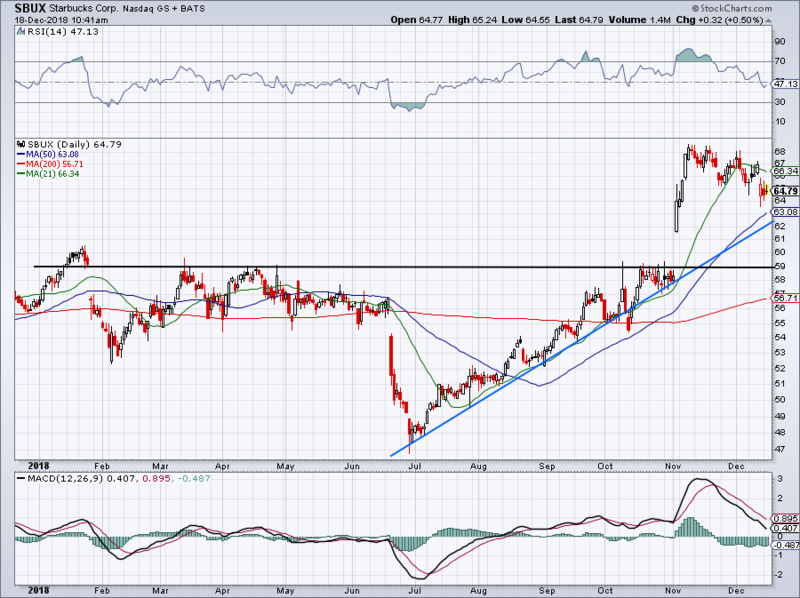 Surprisingly though, Intel (NASDAQ:INTC) stock has held up pretty well. Can it continue to do so? Many look at Intel as a blue-chip technology stock, given its low valuation and dependable yield. But I’m wondering if the recent buying can keep it afloat. Last quarter, Intel issued a solid outlook that seemed to quiet investors’ fears regarding the company’s sudden leadership change earlier this year. Still though, there are concerns about the company’s lack of growth even as it pursues new industries and opportunities. 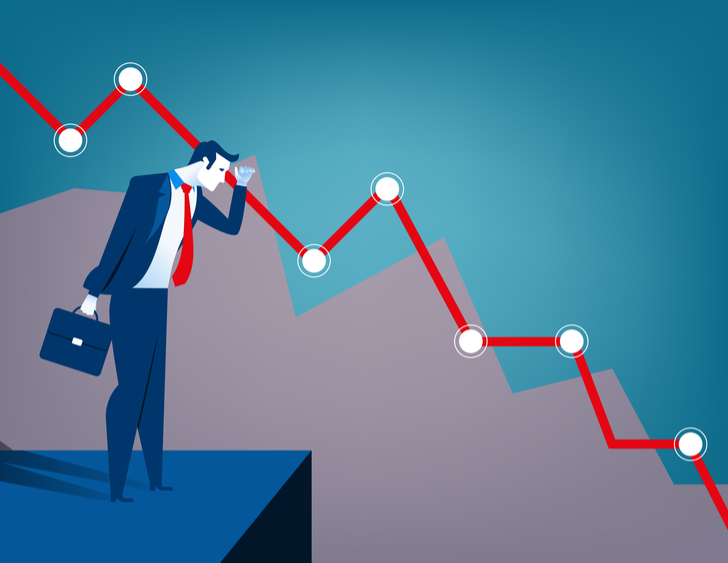 As such, analysts are only looking for 3% sales growth in 2019 and sub-1% earnings growth. We’ve seen the 50-day acting as support or resistance at various times, highlighted by the green and red circles on the chart above. Currently, it’s acting as support, while the 200-day moving average is resistance. The longer a stock is below its 200-day, the harder it is to get bullish. $49 has also been a pretty stiff line in the sand. 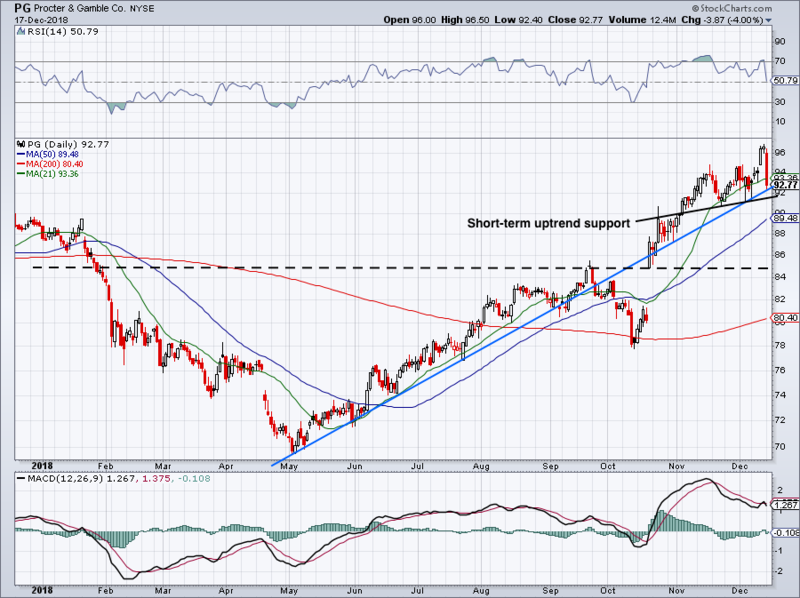 If Intel stock comes under pressure and loses the 50-day support level, shares could be in for a bruising fall. This will hurt already skeptical tech investors, as sentiment sours even more. Not many people think of Starbucks (NASDAQ:SBUX) deserving to be on a list of blue-chip stocks. But why not? It has made its dividend a serious priority, has a cash-cow business in the U.S. and a budding growth plan in China, and continues to report record results year after year. Yes the company may be struggling through a long-lasting transition, but that doesn’t make it a bad company. In fact, far from it. Despite its high-quality business and leadership team, the stock has also been on fire. It’s one of the few big winners from the quarter. In fact, SBUX is the third-best performing stock in the S&P 500, behind takeover targets Red Hat (NASDAQ:RHT) and Scana Corp (NYSE:SCG). After its recent analyst meeting though, doubts are starting to creep in. The company issued guidance that came up short of long-term expectations and while earnings in January could give it another boost, sellers could be lining up as the momentum may be leaving SBUX. 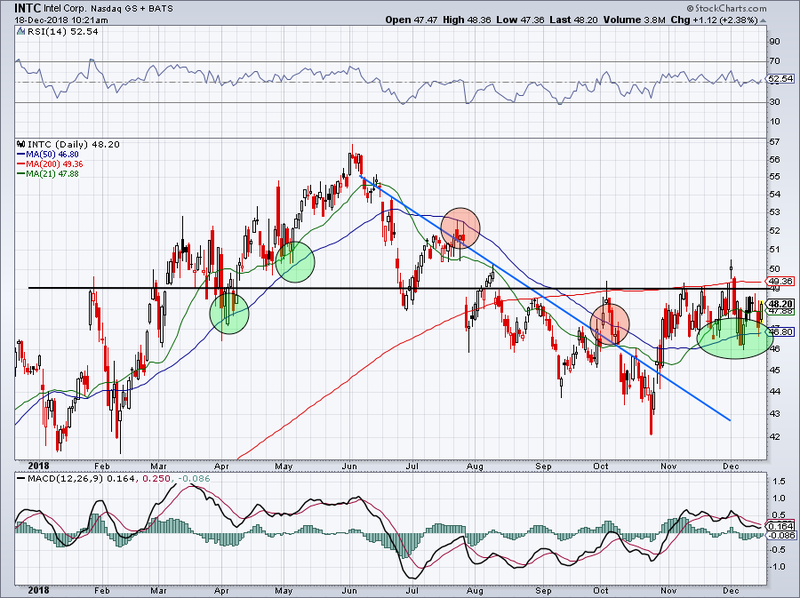 Consolidating in this $64 to $65 area, SBUX is nearing its 50-day moving average. If it loses this level and uptrend support (blue line) can’t keep it afloat, a drop down the $59 level could certainly be in the cards. One of the best-performing groups this quarter and since summer has been REITs. We have been pounding the table on high-quality REIT stocks over the last 6 to 12 months here on InvestorPlace, giving readers a chance to load up on this great group. I like REITs because of their dependable yield and Realty Income (NYSE:O) is no exception. But could they be heading for trouble in the short term? We saw a quick and sharp pullback on Friday that resulted in a test of the 21-day moving average. It’s holding up so far, but should it fail, the 50-day is next in line. This one has been a monster from the February lows, so some cooling off action wouldn’t be a surprise. Ultimately, we could see a 10% drop from the highs, which would land O around the 50-day moving average and uptrend support. Is this a guarantee? Of course not. The Fed just hiked rates and projected two more hikes in 2019, and O stock has already dropped 1.5% on the news. The Fed hike could mean further weakness in the REITs. But we’re still seeing a snap reaction, so let’s see how O stock — and the group — digests the Fed’s announcement. Bret Kenwell is the manager and author of Future Blue Chips and is on Twitter @BretKenwell. As of this writing, Bret Kenwell is long SBUX, NVDA and O. Article printed from InvestorPlace Media, https://investorplace.com/2018/12/5-blue-chip-stocks-that-could-break-their-bull-trend/.